Nature in South Africa is rather grand. Everything a little larger than life, a little more verdant, a little more unique and unduplicated by god. 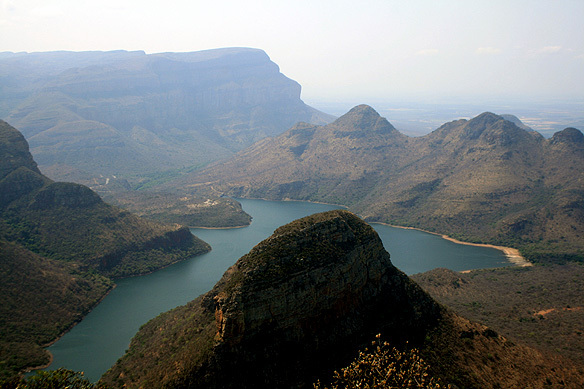 The Panorama Route’s first highlight is the Blyde River Canyon with the Three Rondavels standing sentry on the side; the latter evocative of the huts of the country’s indigenous people. 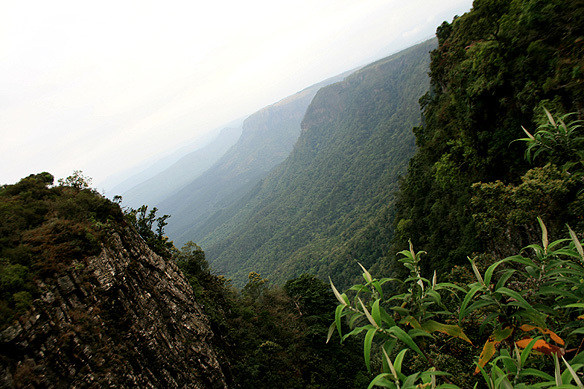 The largest ‘green’ canyon in the world because of its lush subtropical vegetation, and the third largest canyon in terms of size, Blyde River Canyon is 26 kilometres in length and 800 metres deep on average. Just around the corner is Bourke’s Luck Potholes, one of nature’s little masterpieces. Named after a gold-digger, Tom Bourke, the potholes on the river bed at the confluence of the Treur and Blyde rivers are the result of swirling whirlpools over millennia. 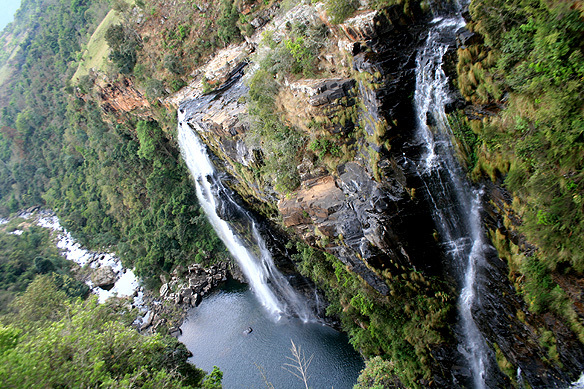 The Canyon, together with the Potholes, form part of the 25,000 hectare Blyde River Canyon Nature Reserve which contains more than 1,000 species of flora, many of which are endemic and/ or endangered. 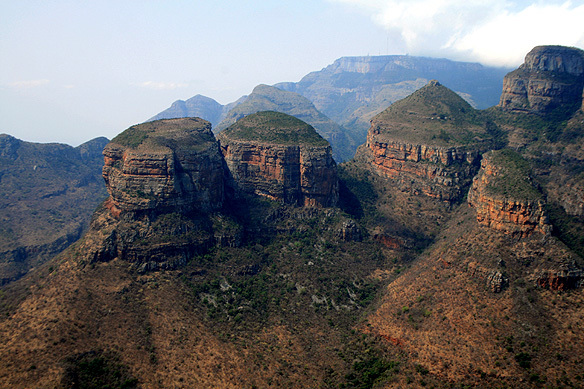 At the southern edge of the reserve is God’s Window where the Drakensberg Escarpment—a 250-kilometre long wall of sheer cliffs—plummets 700 metres deep into the lowveld and the Kruger National Park beyond. 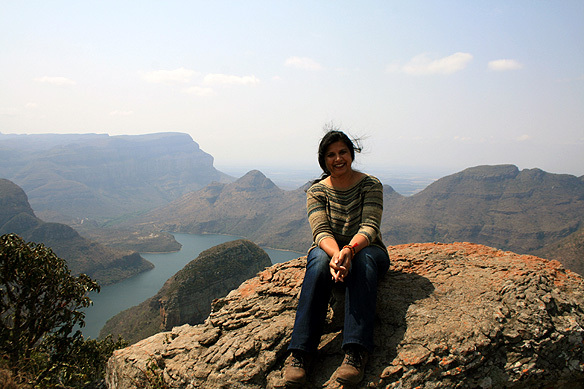 I drove on still higher, on to Wonder View, for a bird’s eye view of the lowveld. The kind of views dreams are made of, and which unfortunately cameras are no good at capturing. 😦 You can only absorb it in and make it part of your being. The journey … Blyde River Canyon, the largest ‘green’ canyon in the world. The Three Rondavels are reminiscent of the indigenous people’s huts. 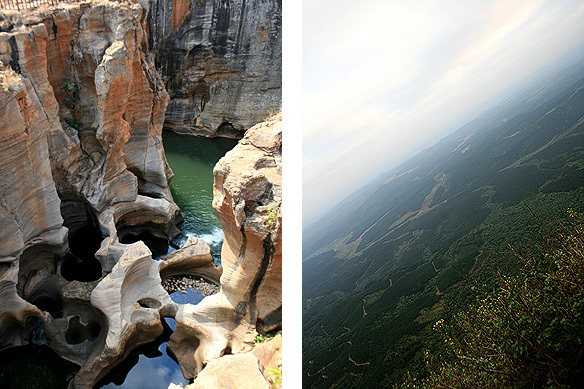 Nature’s art [from top clockwise]: Bourke’s Luck Potholes, Wonder View, A walking trail at Wonder View’s viewpoint. God’s Window and the Lisbon Waterfalls. The Escarpment is rich in streams and plunging waterfalls—a short detour brought me to Lisbon Falls, the highest falls in the area with three streams dropping 92 metres into a pearly pool in the gorge below. And with this I came to the end of the scenic highlights of my journey. But there was more, and the other part was the cultural and historical element. 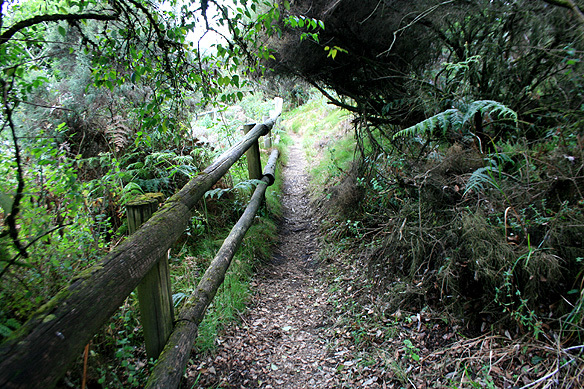 The area around Pilgrim’s Rest, also on the route, was once the site of a massive gold rush with 1,500 diggers working on 4,000 claims following Alec “Wheelbarrow” Patterson’s discovery of gold deposits in Pilgrim’s Creek. Officially declared a gold-field in 1873, alluvial gold then lined the beds and banks of the creek whilst gold nuggets lay lodged under boulders. Mining in the village carried on till as late as 1971. 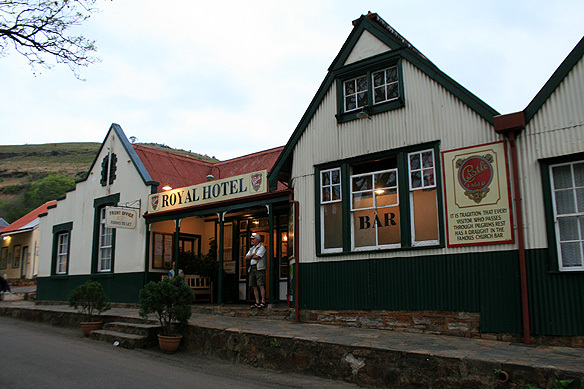 In 1986, the whole village was declared a National Monument in remembrance of the old Transvaal gold rush in South Africa; the Victorian houses and buildings are still intact. Pilgrim’s Rest is like stepping back in time. One expects to see a gold-digger lazily saunter through the street with his findings for the day or hear the sound of hoofs as carriages drive past Royal Hotel. It was also now approaching dusk and time for me to move on. The road leading out from Pilgrim’s Rest is unlit with sharp bends hugging the mountain sides. The historical part of the Panorama Route is centred around 19th Century Pilgrim’s Rest where time stands cocooned and still. This entry was posted in Exploring our World, South Africa and tagged Adventure Travel, Alec Wheelbarrow Patterson, Blyde River Canyon, Bourke’s Luck Potholes, Drakensberg Mountains, God’s Window, Gold Mining, Kruger National Park, Lisbon Falls, Old Transvaal Gold Rush, Panorama Route, Pilgrim’s Rest, South Africa, South African Tourism, Things to do in South Africa, Three Rondavels by Rama Arya. Bookmark the permalink. yeah its really awesome.. I wish i can travel there once..